Just because the mercury's rising doesn't mean you have to ditch the summer desserts thanks to easy no-bake desserts that kids love — marshmallow pops. From varieties that pay homage to our country to bite-sized versions of summertime fun, check out these three summer marshmallow pops that don't require you to turn on the oven. 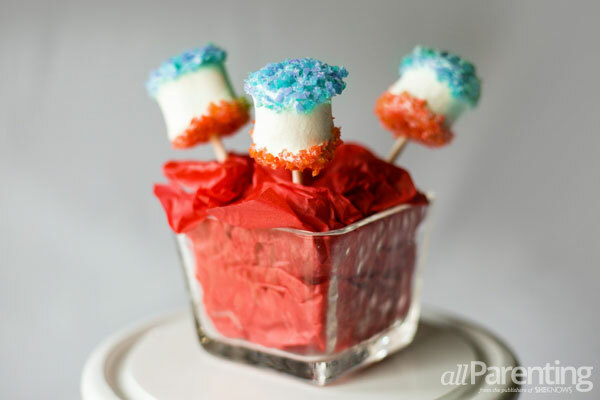 Your guests will be in for a poppin' surprise when they take a bite of these patriotic marshmallow pops with an explosive secret ingredient: popping candy. First, melt a small amount of candy in a double boiler until smooth. Or, nuke it in a microwave-safe bowl in the microwave for 30-second intervals at 50-percent power until smooth, stirring well between each interval. While your candy melts are melting, pour your red and blue popping candy into 2 separate bowls. Next, dip 1/3 of your marshmallow into the white candy melt and immediately sprinkle with popping candy. Set on a sheet of wax paper until set and repeat with remaining marshmallows. 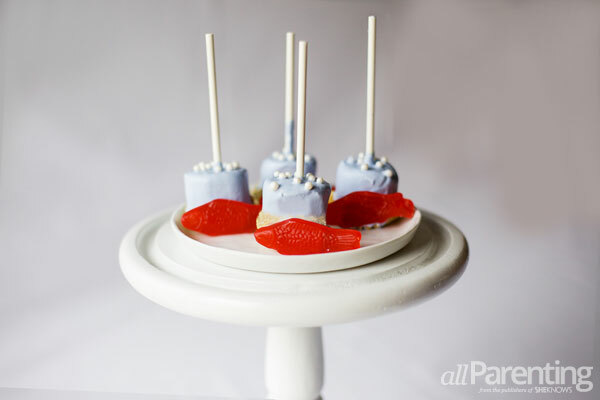 Then, push a lollipop stick into the center of the marshmallow on the end you just dipped in the candy and dip 1/3 of the opposite end into the white candy melt before sprinkling with popping candy. You should end up with red popping candy on 1 side, uncoated white marshmallow in the middle and blue popping candy on the other side to form a red, white and blue pattern. Finally, stick into a Styrofoam block, bean-filled cup or anything that will keep your marshmallow pop upright until it dries and your easy no-bake dessert will be bursting with flavor — and sound — when your guests take a nibble. Note: You can place them on a sheet of waxed paper and set in the fridge for 5 to 10 minutes if you're pressed for time. Bring some under-the-sea fun to your next summer bash with these summer desserts that won't require a swimsuit. First, melt a small amount of candy in a double boiler until smooth. Or, nuke it in a microwave-safe bowl in the microwave for 30-second intervals at 50-percent power until smooth, stirring well between each interval. Next, place your graham crackers into a zipper-closed bag and crush into crumbs. Pour into a bowl and set aside. Then, place a lollipop stick into the end of your marshmallow and: 1) Dip the entire sugary pillow into the melting chocolate to completely cover; 2) Immediately dip the end of your marshmallow pop into your graham cracker crumbs; 3) Sprinkle top with edible pearls for a bubbly effect; and 4) Press a single gummy fish into the side of your summer dessert just above the graham cracker layer. Note: You can allow your marshmallow pop to dry before securing your fish to your summer dessert with a dollop of frosting if you wish. Finally, set your easy dessert onto a sheet of waxed paper and set the candy coating in the fridge for 5 to 10 minutes before serving up this seaside dessert wherever the party takes you. Even when you're not roughing it you can bring the tastes of summer campfires to your next shindig with these classic camping treats you can whip up without getting a face full of campfire smoke. 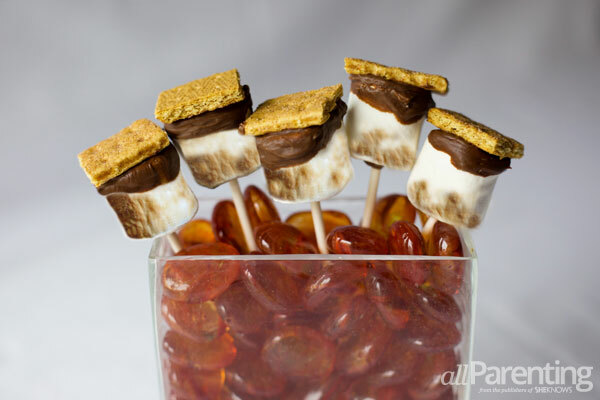 Next, dip half of your marshmallow in the melting candy and stick a square of graham cracker on the chocolate end before the candy coating dries. Set on a strip of waxed paper and place in the refrigerator for 5 to 10 minutes until set. Then use your torch or camping lighter to lightly brown the uncovered end of your marshmallow, but be careful not to light it on fire or let it burn. Finally, stick a lollipop stick into the toasted end of the marshmallow pop and your camp-esque summer dessert is ready to serve. Cure your sweet tooth with endless dessert ideas!